This tutorial will show you how to extract only needed characters from a font file so as to minimize the file size for faster loading of the page. Please note that this Font Subsetter does not support Icon fonts like Font Awesome. We use a font "Questrial" downloaded from Google Web Font (https://fonts.google.com/) as an example. Open a website where the font will be used. 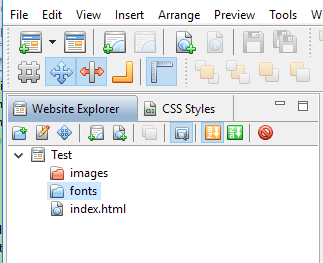 Create a folder "fonts" by clicking on this button in the Website Explorer. Select "Tools" > "Font Subsetter" from the main menu. 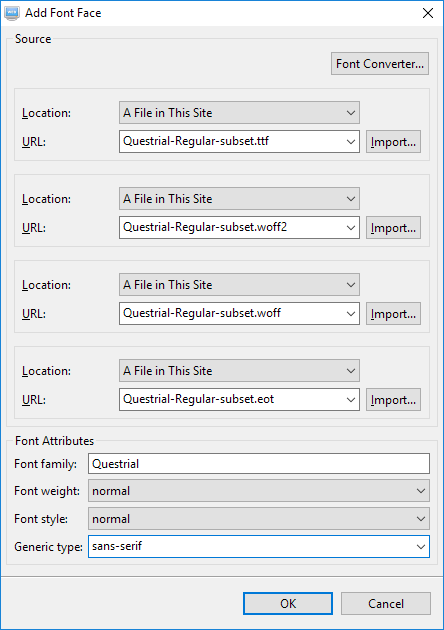 Select the font file "Questrial-Regular.ttf" by clicking on the "Browse" button. Enter "adritech software" to the textbox "Subset string". 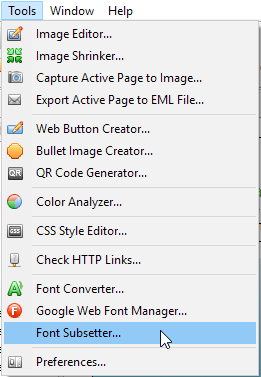 Select folder "fonts" which we created before from the drop down menu of "Output folder". 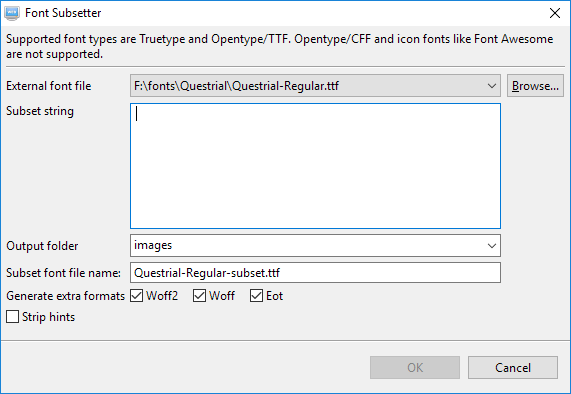 We will just accept the automatically generated font name "Questrial-Regular-subset.ttf" for this subset font. All extra formats are selected by default. We will generate all of them. Browsers will load their supported one automatically. 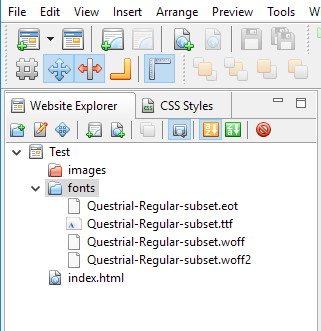 Click on the OK button to generate the subset font files. You will see the following message. 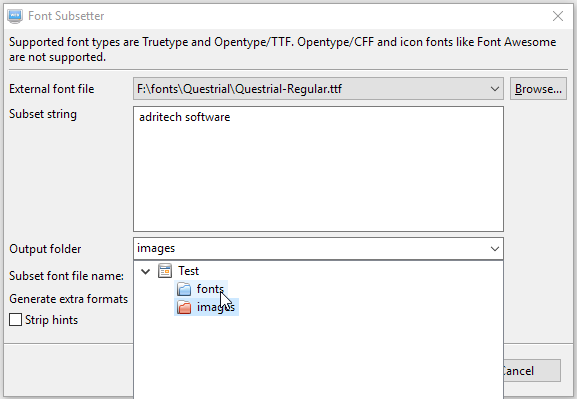 The font files will be generated in the selected folder. You can then follow the steps on "Add online fonts using @font-face" to use these font files. You do not need to use the Font Converter there as all formats have already been generated. Just select them from the drop down menu like the following. 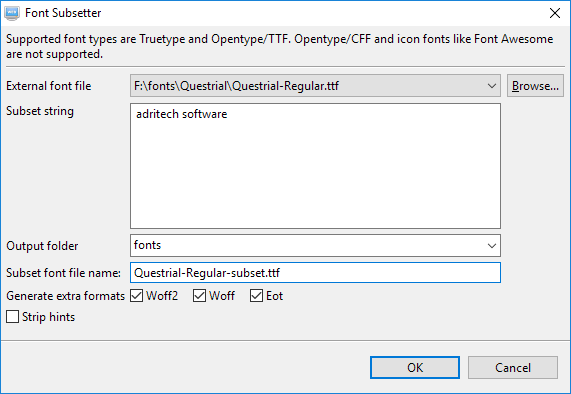 As this is a sans-serif font but the font file does not have this information, so for this font file, you will need to select "sans-serif" from the drop down menu of "Generic type" manually. Only apply the style of this font to the characters in the "Subset string" as it only contains them. The original file is 63KB(TTF) but this one is just 3.89KB(TTF).